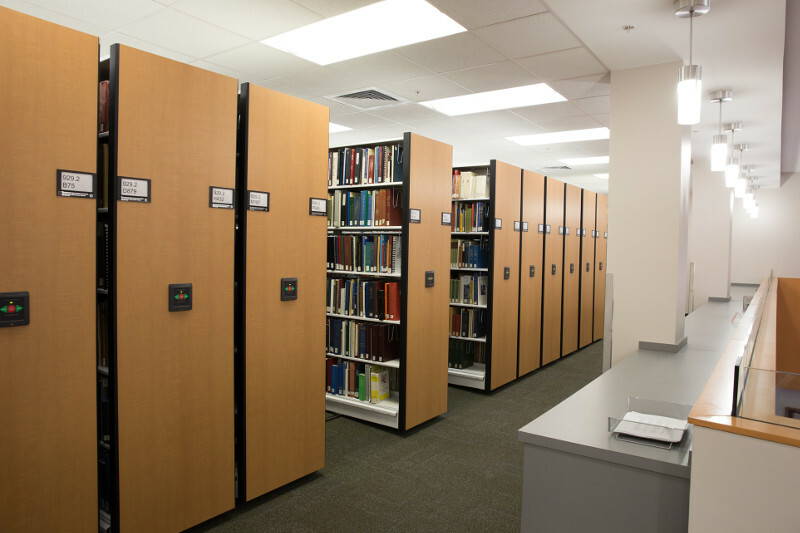 How to Choose the Right Mobile Shelving System for You? 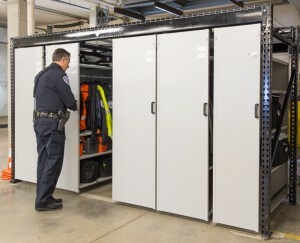 If you’ve had the chance to read our previous blog about the Benefits of High-Density Mobile Storage, you will know the basic concepts of a mobile system and how these systems help with your storage needs. However, that’s not all you need to know to decide which mobile shelving system is right for you – that’s where we can help. 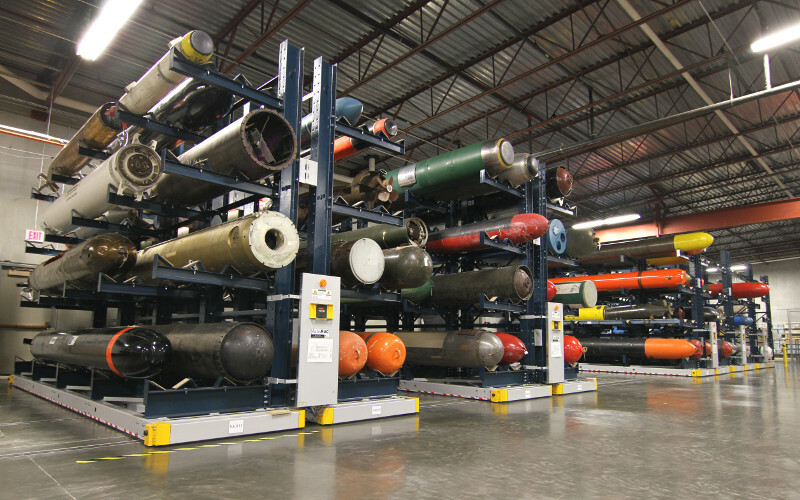 High Density Mobile Shelving Systems have been a key component in helping markets such as: Education, Museums, Industrial Warehouses, and even the Military, reduce wasted space and solve capacity constraints. Every market is different-so shouldn’t your storage be too? These systems are all custom made to fit the individual end user’s needs, not just the “one solution fits all” mentality that some companies provide. 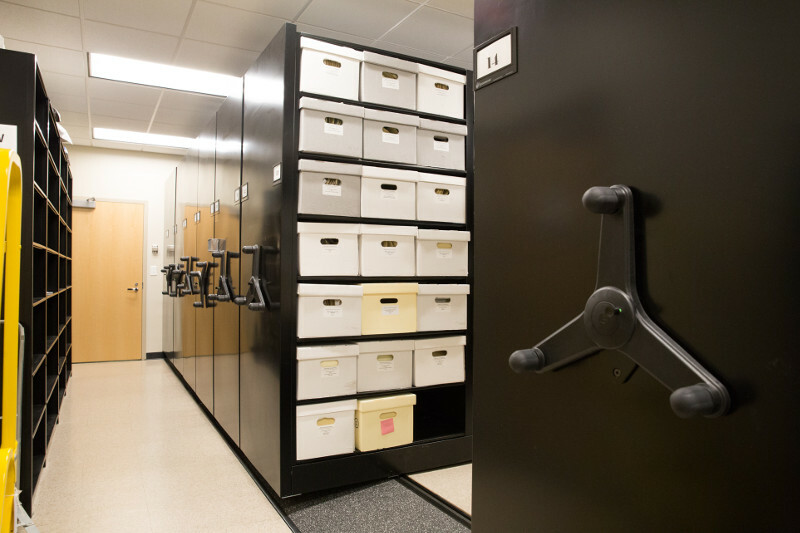 Our storage experts have years of experience in the field and have provided solutions to virtually any market and application, whether it’s for a renovation, new construction, expansion, or just downsizing your space. If you think our mobile systems only store paper or books, think again. 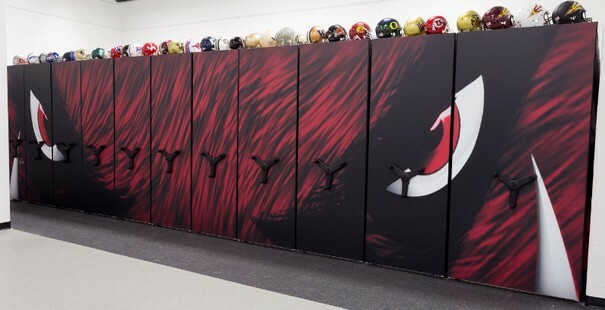 We have the capability to store virtually anything you could think of and if you don’t believe us, just give us shot. 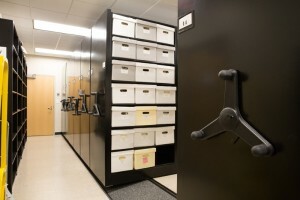 Over the years we’ve stored dinosaur bones, specimens, hydroponic plants, weapons, medical slides, clothing, sports equipment; you name it, we’ve probably stored it. Here are the four main variations and examples of High-Density Mobile Systems; which one is right for you? If you’re still not sure after reading this, don’t stress, we’ll help design the perfect solution to fit your unique storage need. 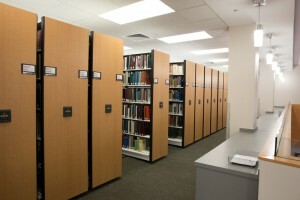 The concept of High Density Mobile Shelving Systems is all the same, regardless of which variation you go with. These systems eliminate fixed aisle space while still offering complete accessibility to your items. 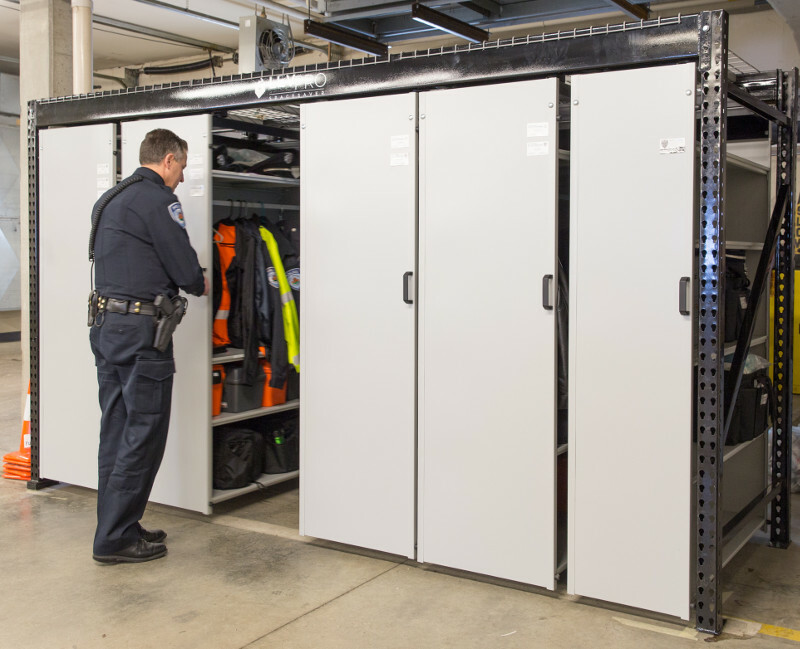 With the Standard Mobile Systems, you can store various weight load capacities and is our most commonly used system we offer. This system comes in three different modes of operation: Powered, Mechanical Assist, and Manual. If you would like additional information, click here to read more. While heavy-duty mobile storage racks are certainly ideal for warehouse applications, they’re also ideal whenever a compact solution for heavy items or bulk storage is required. This can be anything from dinosaur bones, beer kegs, automotive parts, and even turbines. 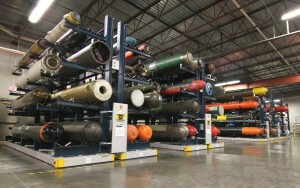 These type of heavy-duty mobile storage racks are called ActivRAC systems and they come in three different systems, ranging in load capacities from 7,000 to 30,000 pounds per section. These systems can come in either mechanical assist or powered. Click here to learn more. We’ve helped businesses in any size and market regain needed storage space with the help of Wheelhouse low-profile mobile shelving systems. This system offers the same features as a standard high-density mobile system, with the added benefit of being a low-install impact in cost and site disturbance. This is a great option for customers that are leasing property but still want the added benefits of high density mobile storage. Click here to read more. This mobile storage system is unique because unlike traditional High Density Mobile Shelving Systems, LEVPRO is a rail-less mobile storage system with the shelving on an overhead track instead of mounted on the floor. This design and steel construction make it durable for years of use, and makes it easy to add onto or relocate if needed. There are a variety of accessories available to help you keep your stuff organized, no matter what you’re looking to store. Click here to discover more.